Encrypt your NFS packets end to end with krb5p and ONTAP 9.2! | Why Is The Internet Broken? Encrypt your NFS packets end to end with krb5p and ONTAP 9.2! With NFSv3 and prior, there was certainly truth to that, especially when NFS was mounted without Kerberos. But even using Kerberos in NFSv3 wasn’t necessarily secure, as it only was applied to the NFS packets and not the extraneous services like NLM, NSM, mountd, etc. NFSv4.x improved NFS security greatly by implementing a single port, ACLs, ID domain names and more tightly integrated support for Kerberos, among other improvements. However, simple krb5 authentication by itself only encrypts the initial mounts and not the NFS packets themselves. The p in krb5p stands for “privacy,” and it does that by way of Kerberos encryption of the NFS conversation end-to-end, via the specified encryption strength. The strongest you can currently use is AES-256. ONTAP 9.0 and later supports krb5p and AES-256 encryption. Krb5p is similar to SMB3 encryption/signing and sealing in its functionality. 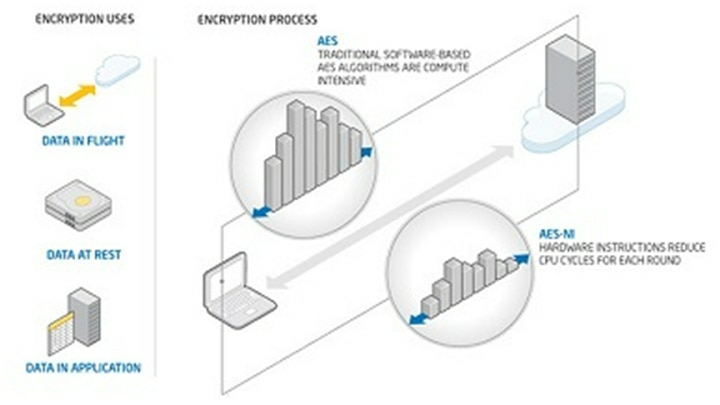 AES-NI offloading is a feature available on specific Intel CPUs that allow encryption processing to use hardware acceleration instructions to offload processing for encryption. This allows the encryption to be done separately to alleviate performance bottlenecks. Intel® AES New Instructions (Intel® AES NI) is a new encryption instruction set that improves on the Advanced Encryption Standard (AES) algorithm and accelerates the encryption of data in the Intel® Xeon® processor family and the Intel® Core™ processor family. Comprised of seven new instructions, Intel® AES-NI gives your IT environment faster, more affordable data protection and greater security; making pervasive encryption feasible in areas where previously it was not. Krb5p support was added in ONTAP 9.0, but the performance was pretty awful, due to the lack of AES-NI support. In ONTAP 9.0, krb5p wasn’t ever able to achieve above 12k IOPS for 4k reads in these SIO tests, and what it was able to achieve, it did it at some pretty severe latency. Krb5i did a little better, but krb5 and auth_sys performed way better. Writes are even worse for krb5p in ONTAP 9.0 – we didn’t even get to 10k. For 8K sequential reads in ONTAP 9.0, latency is about the same. Fewer ops, but that’s because we’re doing the same amount of work in bigger I/O chunks. NOTE: ONTAP 9.1 was not tested, but I’d expect similar performance, as we don’t do AES-NI offloading for NFS in that release. Now, let’s compare those same tests to ONTAP 9.2 with the AES-NI offloading and other performance enhancements. In the graphs below, there are a few things to point out. With ONTAP 9.2, you can now get enterprise class security with Kerberos 5p along with performance that doesn’t kill your workloads. If you’re doing NFS with any flavor of Kerberos, it makes a ton of sense to upgrade to ONTAP 9.2 to receive the performance benefits from AES-NI offloading. Keep in mind that upgrading ONTAP is non-disruptive to NFSv3, as it’s stateless, but will be slightly disruptive to CIFS/SMB and NFSv4.x workloads, due to the statefulness of the protocols. Pingback: Using NFSv4.x ACLs with NFSv3 in NetApp ONTAP? You betcha! | Why Is The Internet Broken?